Since September 2016, I have been working as the Pitt Partner intern in the Rauh Jewish History Program & Archives at the Detre Library & Archives. As an intern, much of my work consists of organizing, preserving, researching, and describing collections of family papers, for the benefit of future researchers and historians. As I’ve worked with these collections, I’ve become much more familiar with the history of Pittsburgh’s Jewish community. One of the things that stands out most about the Jewish immigrant experience in Pittsburgh, especially during the first half of the 20th century, is the challenge of actually getting here. Of the archival material I’ve worked with, two collections in particular exemplify the struggles of German- and Eastern European Jews to make the journey to the United States in times of great political upheaval. Those collections are the Marcia Robbins papers and the Eric Moses papers. The Marcia Robbins collection was one of the first projects I worked on, and it is one of the most mysterious in the archives. The narrative presented through the materials has all the hallmarks of an epic novel: full of lost love, political intrigue, wild speculation, and an around-the-world journey to reunite with a missing father. Letter to Sol Rabinovitch, 1919. Marcia Robbins papers, Detre Library & Archives at the History Center. The story begins with Marcia Robbins’ parents – Solomon “Sol” Robbins (born Rabinowitz) and Chana/Lena Markur, nee Rabinowitz. Sol was born in 1890 in Riga, Latvia. As a young man, he moved to Harbin, China. Much like the boom towns that sprung up along railroads throughout the western U.S., Harbin had been little more than a fishing village before the Russians began building the Trans-Siberian Railway through the area. With the railroad came many Eastern European Jews, some of whom were escaping pogroms in Russia. Chana too, is said to have come to Harbin from Riga, and worked as a music teacher. Sol and Chana met and married, and their daughter Marcia was born sometime between 1914-1918. In 1918, Sol emigrated to Pittsburgh, where his brother, Oscar, had settled, while his wife stayed behind in China. Telegrams from the collection reveal that Sol continued to send money to Chana and Marcia but soon stopped receiving replies. Sol reached out to a Jewish organization in Harbin to try to regain contact with his family, but was unable to. A partial letter dated January of 1919 from Chana’s sister reveals that she has left Harbin for Tomsk, Russia. Chana—by now Lena—is said to have later married a man named Alexander Markur. Meanwhile, Sol Robbins had made his way to Pittsburgh, Pa., and, by 1925, was remarried as well. 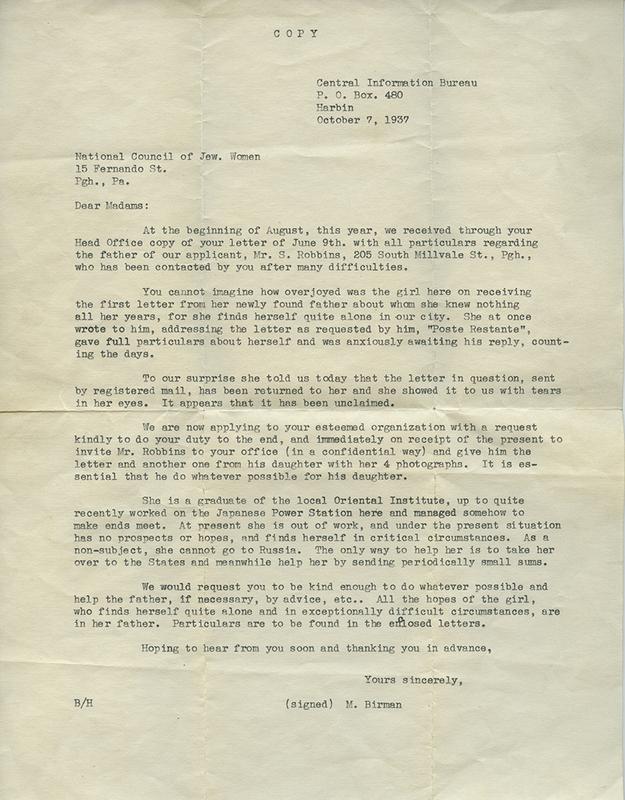 Letter from Central Information Bureau to the National Council of Jewish Women, 1936. Marcia Robbins papers, Detre Library & Archives at the History Center. In a 1938 issue of the Yiddish newspaper “The Jewish Daily Forward,” an article entitled, “The Tangled Family Saga of a Jewish Girl who believed she is the Aryan Daughter of a Nazi in Harbin,” recounts how, after years growing up with her mother’s second husband, Marcia finds out that she is actually Jewish, runs away to her aunt’s house in Harbin, and begins making plans to find her biological father in the U.S. This tabloid-style story is corroborated somewhat by historical context and the remaining documentation of Marcia’s life. Though the collection does not have materials related to Marcia’s stepfather, Alexander Markur, the article may have accused Markur of being a Nazi because of the historical timeline. Chana/Lena left for Tomsk in 1919, a time when Tomsk was a center of power for the right-wing Russian White Army, members of whom later joined forces with the German Nazis during WWII. We do know that Marcia did make her way back to Harbin, which by then was under Japanese occupation, following her mother’s death in 1936. 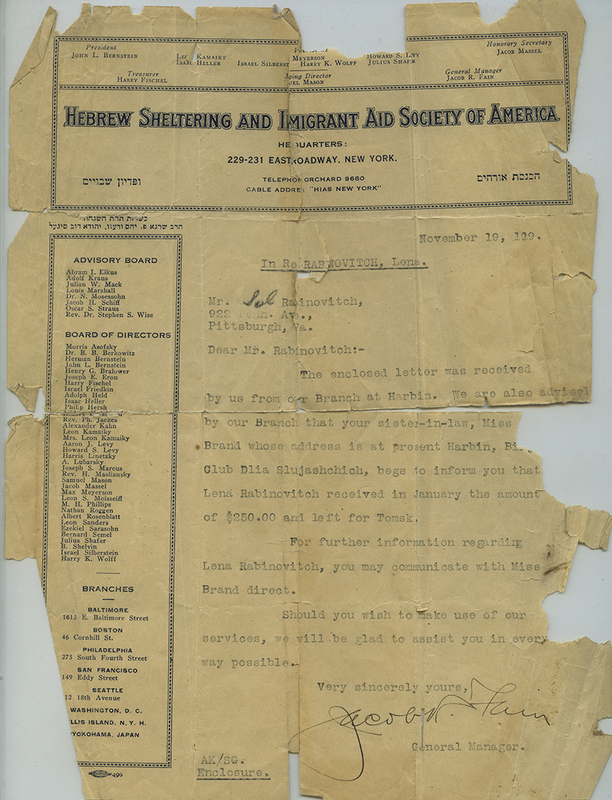 A 1937 letter from the Far Eastern Jewish Central Information Bureau for Emigrants, an organization founded by a delegate of HIAS (the Hebrew Immigrant Aid Society), addressed to the National Council of Jewish Women urges the Council to appeal to Sol Robbins on behalf of his daughter. It also recounts that Marcia had been working at the Japanese Power Station but was now unemployed. As a non-citizen, Marcia could not go back to Russia, and her unknown father in America had become her only hope for escape from the increasingly ominous conditions in Manchukuo. Over the course of 1937, Marcia traveled from Harbin to Kobe, Japan, where she secured passage to San Francisco, Calif. In San Francisco, Marcia was delayed until her father could vouch for her as having relatives in Pittsburgh. After waiting in limbo for weeks, Marcia boarded a train and traveled across the country to Pittsburgh. Much of the narrative of Marcia Robbins and her family remains a mystery despite my study of the collection materials and background research. In part, this is an issue of the fragmentary nature of the collection. But it is also a result of my own linguistic limitations. Living in a Russian community in China which was later under Japanese rule, Marcia was fluent in Russian, Hebrew, Chinese, Japanese, and English, and the materials in the collection reflect that. Translation may provide some answers, but the upheaval of that time and place bears responsibility for many of the gaps in the record as well. Marcia wasn’t a citizen of any of the ruling countries in which she lived, due to changing political regimes and shifting national borders, further complicated by Marcia’s peregrinations and the multiple timelines of Jewish emancipation. Part 2 of this series will focus on the Eric Moses papers (MSS#1117), through which we’ll see a similar story from the other side of the immigration struggle, as Eric Moses, a German Jewish immigrant to Pittsburgh, works to help Jewish families escape from Germany in the years leading up to and during WWII. My name is Ronald Robbins, son of Arthur Robbins. My father told me that he was born in Tomsk in 1905 and that his father, my GrandFather, was a Rabbi and the Chancellor of a Yeshiva. He told me that his last name was Ravkovitch before it became Robbins. My father told me that he had relatives in Portland, Maine that he stayed with shortly after his arrival to America in 1920. In doing research I found that there was an entire family that had emigrated from Russia with the name of Rabinowits that changed their names to Robbins. Do you have any documents that may refer to this?